How does a man live with the constant threat of murder? How does he continue to work when deprived of his freedom? How does he sustain friendships, or fall in and out of love? How does he fight back? 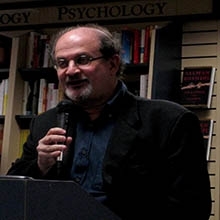 For over a decade, Salman Rushdie lived with a death sentence. He dwelt in a world of secrecy and disguise, a world of securityguards and amorured cars, of aliases and code names. In Joseph Anton, Rushdie tells the tale behind the infamous fatwa. It is a remarkable story of one of the crucial battles, in our time, for freedom of speech, but also an unflinchingly honest and fiercely funny account of a life turned upside – down.